OMG! Get ready for Royal King wedding! 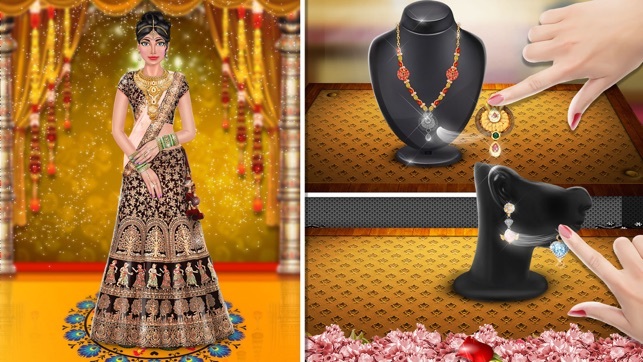 On that Special Day of BFF enjoy Hand & Leg decoration, Hand mehandi, Leg mehandi, Bride haldi, Groom haldi, Underarm spa, Hair spa, Face spa, Makeup, Bride dress up, Groom dressup, Photoshoot, Kamarbandh, Wedding, pre-wedding, post-wedding. The pre-wedding includes all preparations, a party at night before where each side of family can meet each other and dance and have fun. 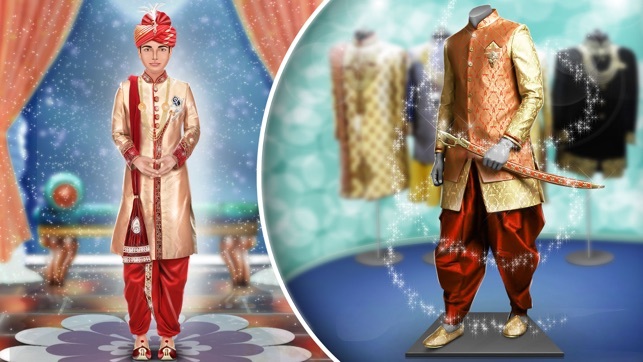 A Pandit, selects day of wedding based on bride and groom’s horoscopes, prayer with family for couple with a happily married life and exchange rings. The bride's and groom's home entrance, doors, wall, floor, roof are sometimes House Cleanup and decorated with colors, balloons, and other decorations is cleaning game for girls. At bridle home Mandap decoration in Indian weddings thrive on idea of a Mandap - a special space allocated for bride, groom, family members and close friends during wedding focus as bride and groom. Few days before, A haldi ceremony organize on bride and groom home. Haldi is use for skin glow. 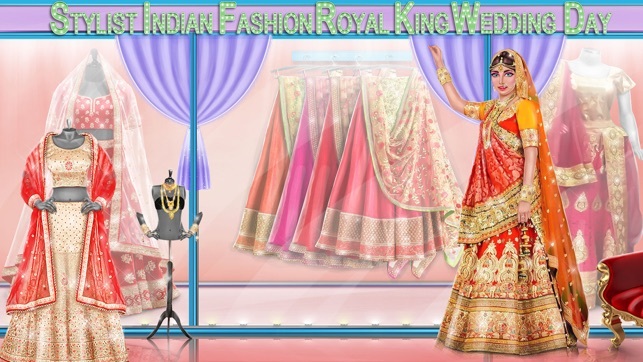 Bridal looks like royal princess with special colorful outfit and her makeup and accessories are amazing for gorgeous Dulhan. 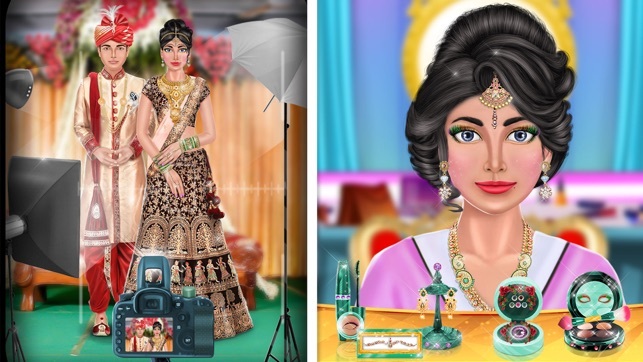 Bride look like Miss world Beauty Queen, Miss Indian, miss universe. Mehndi is a ceremonial art. Unique new mehndi design and art It is typically applied during weddings for brides. Hand and leg jewellery and decoration, hand panja design like hand panja. it made from ground leaves of Henna Plant. Bride makeover with facial Spa, shampoo, hair steamer, Facials ensures deep cleansing, removal of dead cells along with black heads and white heads, better simultaneously makes your skin bright, firm and soft. Just what you need for your wedding day and thereafter for honeymoon Indian First night(Suhagraat). Post wedding rites are Suhagrat, Rasoi Ceremony, Honeymoon Plans and Packing Bags, reach to Honeymoon Destination and enjoy Back spa Salon, Hair Do Designs, Swimming Pool Fun, Bedroom fun. 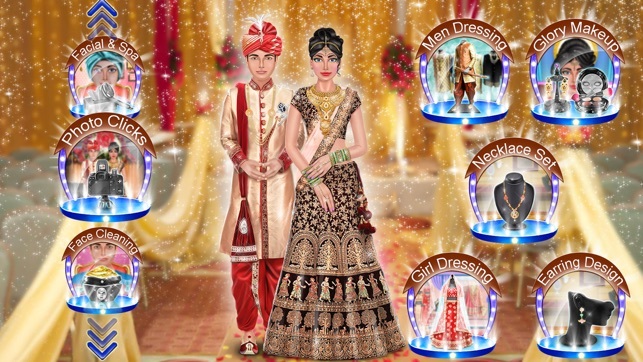 Dress up items for girls Wedding bride dress up game Choose unique Hairstyle, ornaments, jewellery, hairstyle, dress, necklace, jewellery and other accessories for your princess girls ,solah shringar of bride, Indian tradition outfits like Dresses, Chaniya Choli, tops & bottoms for a new bride wedding day more royal and special! Now days Pre-Wedding Photoshoot also arranged in marriage for Indian Designer Bride Fashion Salon games, Indian celebrity come to Traditional Indian outfits, Royal Wedding a Love marriage Story, Wedding ceremony, Indian Doll Fashion Salon, Indian Wedding Salon, Indian Wedding Love with Arrange Marriage, Indian Love Marriage, Fashion Designer for Indian Wedding, Enjoy spa treatment in parlour, International Fashion Star Wedding Makeup Artist Salon, beautiful and unique face packs in Indian Girl Hair Salon, Indian Wedding Makeup, Indian Marriage Dress up, Indian Stylist Salon, Indian Saree Fashion, Asian weddings. Gorgeous look Heena Mehndi designs with Indian Top Model Spa Safety to Royal Princess salon & spa for Indian Fashion Girl, Indian bridal and groom, Indian Couple Romance. 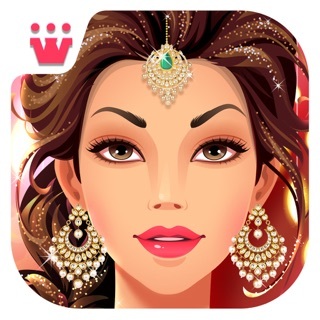 Indian Princess become Indian Prom Girl Salon in Indian Prom queen Salon for Top Country Theme Wedding, Indian Girl Love Crush on Indian Culture and do Manicure, Pedicure, Nail Art Salon, to get ready for Royal wedding rituals fashion salon on this Big Fat Royal Indian Bridal Wedding Salon in this Indian wedding Love Marriage games.